While Israel has sought nothing but to live in peace, cooperation, and mutual benefit with the Arab world, it has been met with hostility and malevolence at every turn. Years ago it was clear who was David and who was Goliath. The bedraggled survivors of the Nazi death camps who had made their way to Palestine bravely fought back five Arab armies that invaded the Jewish homeland “to drive the Jews into the sea,” in the wake of the United Nations vote to partition Palestine. 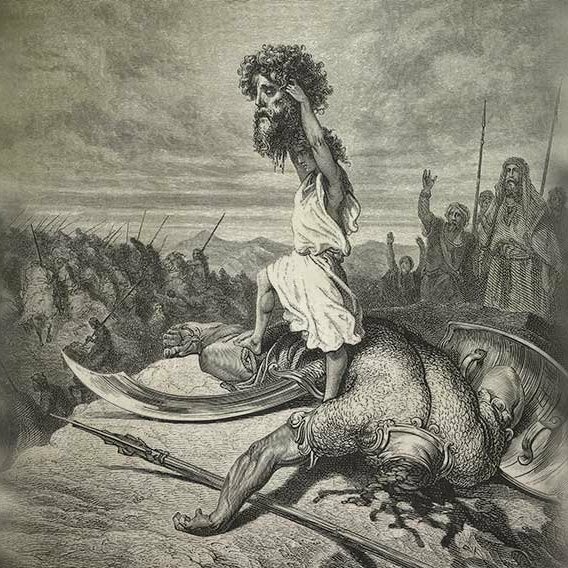 Miraculously, God delivered the under-equipped, untrained Jewish forces against overwhelming odds and gave victory to the fledgling Jewish state. Israel is a mere sliver in an ocean of twenty-two Arab states 650 times greater in size and fifty times greater in population. In addition to the Arab states and Iran, which has openly threatened Israel with annihilation, Hezbollah has 100,000 missiles aimed at Israel, Hamas has engaged Israel in three wars since seizing power, continues to carry out terrorist attacks against the civilian Jewish population, and constructs tunnels for abductions and murder. All the while the Palestine Authority glorifies jihadists and incites the Arabs to perpetrate acts of terrorism. 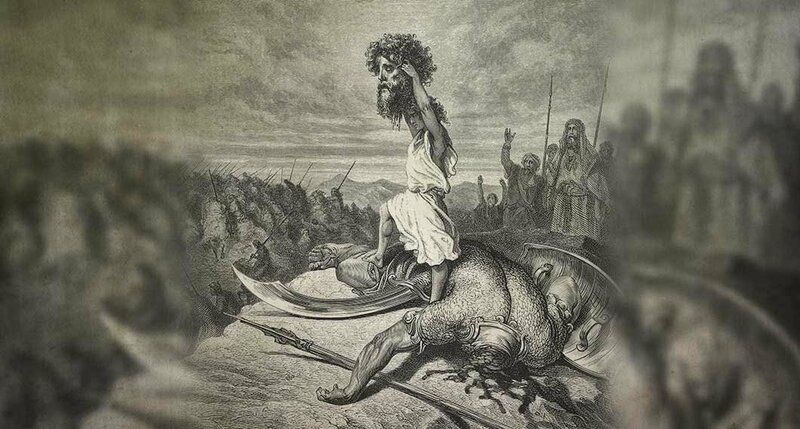 The Arab Goliath trying to throttle the Jewish David. While Israel has sought nothing but to live in peace, cooperation, and mutual benefit with the Arab world, it has been met with hostility and malevolence at every turn. Every war, every conflict, has been initiated by the Arabs, who will not countenance any Jewish presence in the heart of Islam, and they have enlisted the aid of world opinion to isolate and delegitimize the Jewish nation. Israel has been deceitfully portrayed by the media as a colonialist aggressor occupying the land of the indigenous people, the Palestinians. History says otherwise. The Jews are the indigenous inhabitants of the land and have dwelled there uninterrupted for 3,500 years—despite defeat and exile by the Romans and 2,000 years of roaming the earth as a pariah people without a country. In the intervening years the Land was successively occupied by the Byzantines, Persians, Arabs, Crusaders, Turks, Egyptians, and ethnicities of the Ottoman Empire. The League of Nations unanimously voted in 1922 to re-establish the Jewish homeland in the newly created Mandate of Palestine with roughly the borders of ancient Israel. Almost immediately, 80 percent of the land was ceded as Arab state number 22, Jordan. Britain, which administered Palestine, banned the Jews fleeing Hitler’s Europe from entering the remaining 20 percent while Arabs poured in from the neighboring states. Their efforts to prevent the Jews from having their own country led to war and defeat. The resulting refugees reinvented themselves in 1967 as a new entity called the Palestinian people. The EU on its part has directly, or indirectly through hundreds of NGOs, funded the illegal construction of 1,000 Arab buildings on government land, promoted the Palestinian narrative, and participated in the BDS effort. The UN routinely censures Israel and in 2001 at the Durban Conference adopted the resolution that Zionism equals racism. Thirty-eight percent of all critical reports issued by the UN Human Rights Council have been directed against Israel alone. We shouldn’t wonder when we see the world lining up against this tiny Jewish state. The Bible prophesies that Jerusalem will become a cup of trembling and a heavy stone to all the nations around, but that when all the world comes against Israel, the Lord will return to fight for his covenant people. Please bless, defend, and support Israel, the only Jewish country in the world, the country with which God has chosen to bless the other nations of the world.